Needles and Hooks and Books, Oh My! : Work-In-Progress Wednesday: Step One Done! I've had my eye on this sweater for a long time. It's super simple, and all in crochet, which really appealed to me. When I finally decided that it would be on my list of projects for this year, I started planning the colors. I wanted it to look good, and I want to be sure I would wear it. So I ordered KnitPicks Bare worsted wool, knowing that I could dye the yarn to suit me. I had this past Friday off of work, the first Friday in a while, so I made plans to dye a lot of yarn. But that color? 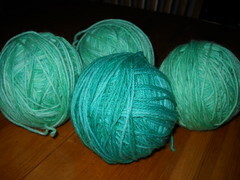 After consulting DyeYourYarn, where the author has amazingly worked up all of last season's Pantone colors, I decided on a light blue-green color. The formula was simple, one part Lemon-Lime Kool-aid to 3 parts Berry-Blue. BUT! 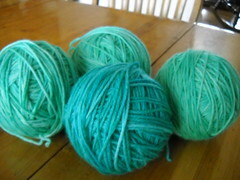 Blue and green are 2 of my favorite colors to dye, and I didn't have enough to dye all my yarn. Fortunately, I have a decent supply of food-coloring, and I added a few drops of blue to each batch to make up for my lack of BB KA. I also knew that it would be nearly impossible to make 3-4 skeins of yarn the exact same color, especially without re-skeining them together. So I decided to make one skein in a semi-contrasting color, and make the sweater striped. So that's my work-in-progress for today- step one of "Mary Makes a Sweater" has been completed. 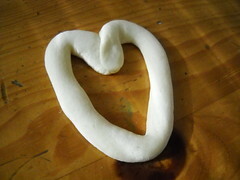 The next step will come as soon as I finish some of my other projects that have been languishing. Head on over to Tami's Amis to check out more wonderful WIPs! My Thursday link-up is Tricia over @ Crunchy Catholic Momma. That yarn is an amazing colour, and will be perfect for that sweater. I love the idea of taking the project right from the colour stage all the way to finishing - it's going to look great! Your hand-dyed yarn looks fabulous! I look forward to seeing the sweater. Love the color of your yarn! And the subtle contrast for the stripes. I'll be back to check out your sweater progress, for sure. Have fun! Those are gorgeous colours! Isn't great when a plan comes together!?! the colour of the yarn is gorgeous! I love the yarn color...nice work! And that pattern looks SO comfy! I'm envious and you haven't even started on it yet! The yarn turned out beautifully! I've never thought of dying my own yarn, but I may have to after looking at that website you shared. Some of the colors on there are so lovely! ooh, I love the way the yarn came out, gorgeous colours :) I love dyeing with kool aid - must get more bare yarn soon! Your dyed yarn came out beautifully, looking forward to seeing it made up! I'm so impressed you dyed your own yarn to meet your preferences! It really is lovely. 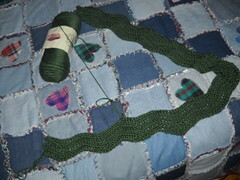 It will be fun to watch as you crochet this project.